PLYMOUTH, Mich. -- Landon Slaggert (South Bend, Ind. ), Hunter McKown (San Jose, Calif.), and Ryder Rolston (Birmingham, Mich.) scored one apiece in the U.S. National Under-17 Team’s 4-3 shootout loss to the Youngstown Phantoms on Friday, Mar. 29 at USA Hockey Arena. The U17's record is now 18-22-3-5 (W-L-OTL-SOL), while Team USA’s combined record in USHL play is 29-18-2-6. The Youngstown Phantoms’ record is now 32-19-1-4 (W-L-OTL-SOL). The Phantoms opened scoring with 9:11 remaining in the first frame when Ben Schoen scored unassisted. 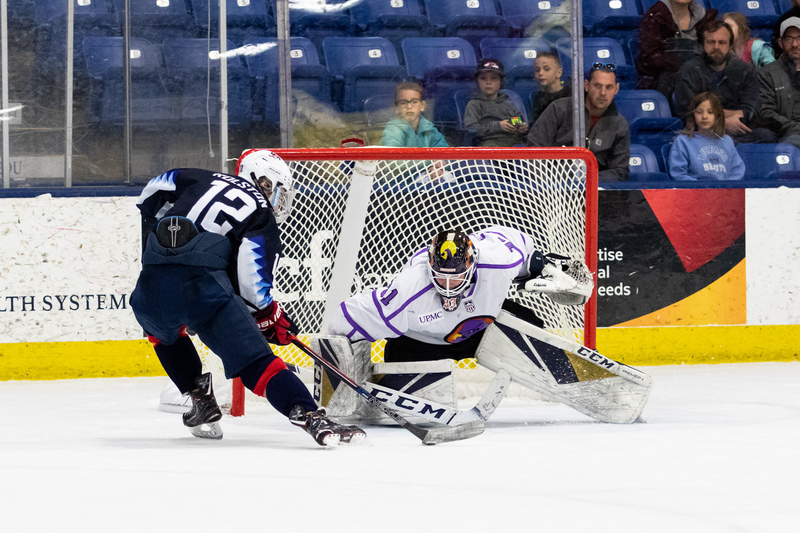 Two minutes and 30 seconds later, Slaggert took a pass from Hunter Strand (Anchorage, Alaska) in the slot and sent a wrist shot past Phantoms goaltender Chad Veltri. The period ended with the scored tied at one apiece. McKown scored the only goal of the second period, capitalizing on the rebound from Connor Kelley’s (Maple Grove, Minn.) shot from the point to give the U17s a 2-1 lead at 2:38 of the middle frame. The U17s led the Phantoms in shots, 30-11, after two periods of play. Rolston cut around the outer right circle to sent the puck under the crossbar, one minute and one second into the third period, to give the U17s a 3-1 lead. Phantoms forward Connor MacEachern scored two unanswered goals to tie the game up, 3-3--the first at 7:50, and the tying goal at 9:52. The game went to overtime and the Phantoms took the game, 4-3, in a seven-round shootout. Noah Grannan (Germantown, Wis,) and Drew Commesso (Norwell, Mass.) made a combined 23 saves in net. NOTES: Team USA was 0-for-1 on the power play and went 4-for-4 on the penalty kill… Team USA outshot the Phantoms, 44-26… Hunter Strand earned Hardest Worker of the Game… Ben Schoen earned Third Star of the Game… Landon Slaggert earned Second Star of the Game… Connor MacEachern earned First Star of the Game. The U.S. National Under-17 Team returns to action on Friday, Apr. 5 against the Fargo Force at Scheels Arena. The next game at USA Hockey Arena is tomorrow, Mar. 30, when the U.S. National Under-18 plays its final home game against the Youngstown Phantoms at 7:00 p.m. ET. Tickets for all home games can be purchased online at USAHockeyNTDP.com/Tix, by calling 734-453-6400, or visiting the box office.